This chapel is spoken of as “A Sermon in Stone” for its witness of the Gospel message through sacred art and architecture. The Andrew Gerow Hodges Chapel was consecrated as a hallowed place of worship in 1995. It is dedicated to the glory of the living, Triune God for the service of his church and the furtherance of his kingdom. This chapel is spoken of as “A Sermon in Stone” for its gospel witness through sacred art and architecture to the Samford community, the greater Birmingham community, and the far-reaching places of the world. The visible prominence of Hodges Chapel at the center of the divinity school reminds us of the centrality of worship in all we do. When Beeson Divinity School was founded in 1988, one of Mr. Ralph Beeson’s requests was that the divinity school house a “special” chapel. Though he did not live to see its completion, Mr. Beeson’s wishes were fulfilled. Designed by architect Neil Davis, Hodges Chapel is a unique house of worship redolent with beautiful art and symbols of the Christian faith, which turn our attention heavenward beyond the chapel dome. In the fall of 2002, the chapel was officially named in honor of Andrew Gerow Hodges, who was a personal friend and advisor to the late Mr. Beeson. 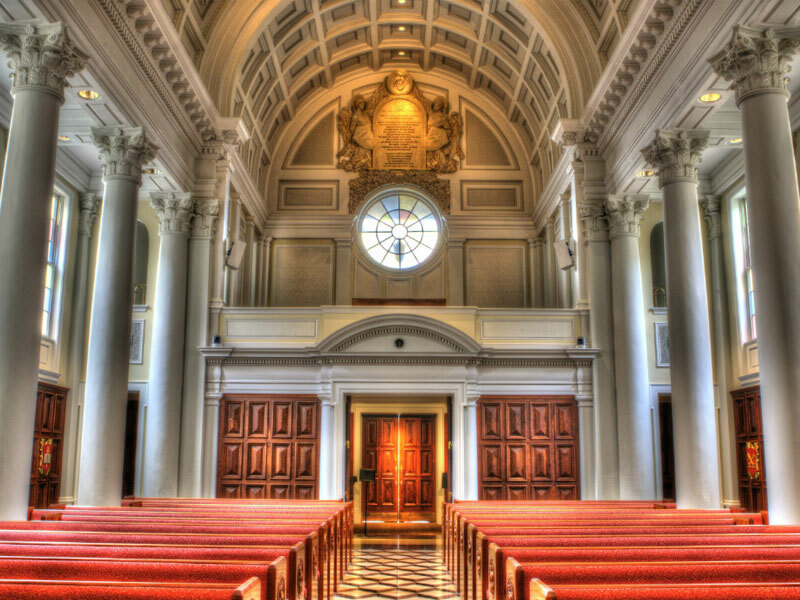 A variety of worship services takes place in Hodges Chapel throughout the year. The Beeson community and the wider Samford community gather each Tuesday during the semester for a weekly chapel service. Other events, such as endowed lecture series, take place in the chapel throughout the year. Hodges Chapel is open Monday through Friday from 8:00 a.m. to 4:30 p.m. for tours, personal prayer, and meditation. Beeson is an evangelical, interdenominational theological school, and the doors of Hodges Chapel are open to all visitors. Tours can be requested through the Office of the Curator (205-726-2227) or, for large groups, online. May Jesus Christ’s invitation, “Come unto me all who are heavy laden, and I will refresh you," be found by all who enter this sacred place. Click the image below for a virtual reality, 360 degree view of Hodges Chapel.